Kakerlakes, while not overly aggressive, have little regard for the safety of themselves or those around them—the Plebs simply don’t care, and the patriarchs are effectively immortal. The Patriarchs behave less like a ruling body and more like a bunch of old war buddies on an extended safari. They have considerable interest in the culture, technology and food of other species. Plebs are unaugmented, lack initiative, and will obey the commands of anyone who is convincing enough. Kakerlake are evolved from a cockroach-like species that infested a generation ship some millions of years ago. The ship’s original crew perished some generations into their voyage, and were kind enough to sabotage the radiation shielding before they died. Only some plant life and pests survived the radiation, and as the ship drifted through space they evolved to match their environment. Gradually, the Kakerlakes developed an instinctual understanding of tools sophisticated enough to maintain and even repair portions of the generation ship. The ship drifts for millions of years, and eventually encounters other alien life. The Gedune uplift the Kakerlakes, augmenting some of their number with cybernetic computer systems, granting them long-term memory. 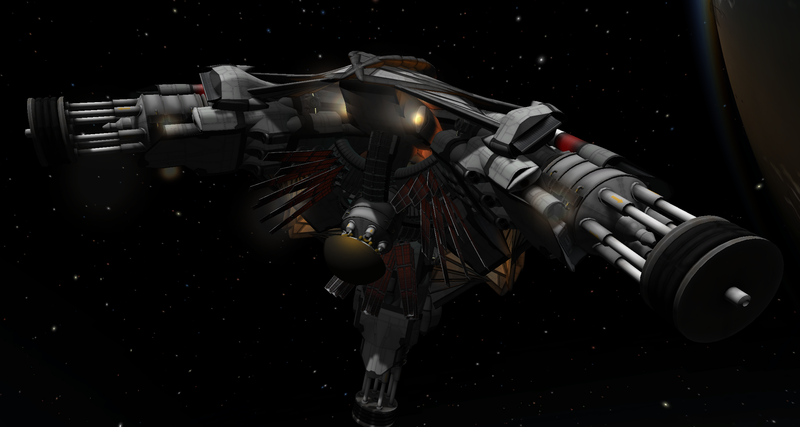 The first augmented Kakerlakes turned out to be skilled negotiators with little regard for their unaugmented brethren, and promptly sold many of the Plebs aboard into slavery in exchange for the repair and refit of their ship. These twelve augmented Kakerlakes formed the leadership (calling themselves "The Patriarchy"), and continued on their merry way. The Kakerlak are evolved cockroaches, 3-4 feet in length. They have a maximum lifespan of around a decade. Like normal cockroaches (but more so), Kakerlake are almost immune to radiation, able to survive thousands of times the radiation a human could. They can survive hundreds of gravities of acceleration, and are very resilient in general. They can function in vacuum for more than an hour without oxygen, regenerate lost limbs, and are even receptive to freeze-drying. Although they have a natural aptitude for tools and language, the average Kakerlak is comparable in intelligence with a dumb human. Even the smartest could only be considered to be of average intellect by other sentient species. And all un-augmented Kakerlake have a long term memory that lasts no longer than a week. Although their instinctual skills make them well suited for the basic operation and maintenance of a spacecraft, without direction they are hopeless. There are more than six thousand un-augmented Kakerlake (Plebs) aboard BOOMTOWN. Because of their resilience and regenerative capabilities, Kakerlake are easy to cybernetically augment. The plebs are led by the Patriarchs, who are augmented with computer systems which merge seamlessly with the brain. The computer systems record for and direct the Kakerlak, imparting long term memories and enhancing their cogitation. Only the smartest among the pllebs are typically chosen for cybernetic augmentation, and those gain a plethora of computerized tools to aid them in mathematics, navigation and translation, among other subjects. 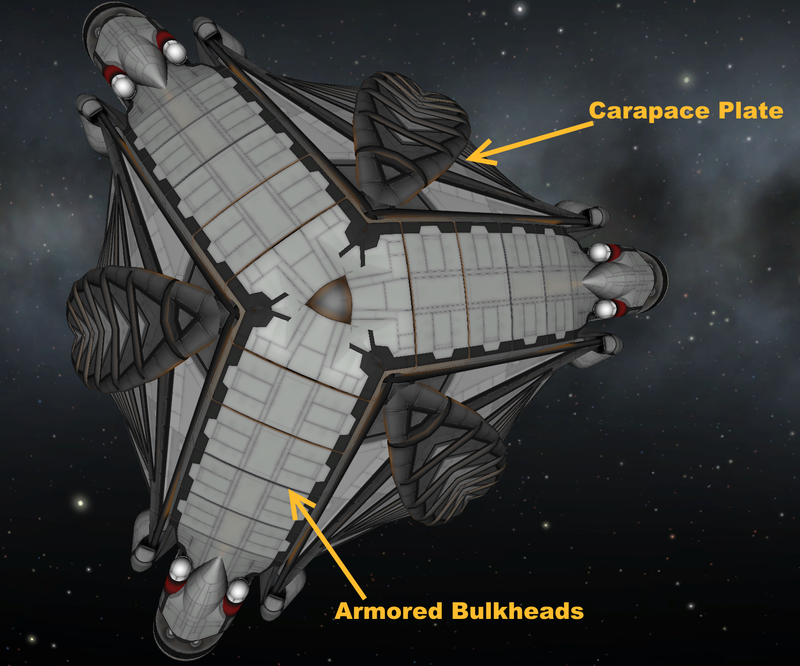 Because long-term memory retention is solely the job of the cybernetics, Kakerlakes have attained effective immortality, and can even be transferred from cockroach to shipboard computer. Patriarch Kakerlakes are old; some have lived thousands of lifetimes. There are only twelve of them, and not one has yet died a true death. As the Kakerlake journey between stars, they reside solely within the ship’s computers, except for the one patriarch designated as the Watcher. During the long journeys through deep space these patriarchs guide their species’ evolution through a mixture of selective breeding and genetic engineering. Kakerlakes are omnivores, and will eat anything, even dead Kakerlake. Kakerlake females are smaller than the males and give birth to as many as a dozen egg cases in a single year—each containing 40-60 eggs. Where space and resources are limited (as they usually are aboard BOOMTOWN), the young eat one another until the population crisis is resolved. Kakerlake exoskeletons are resistant to small arms fire and their underdeveloped wings allow them to, with significant effort, fly under Earth gravity. Very resistant to radiation, vacuum, toxins. Can withstand tremendous acceleration and are generally very durable. No long term memory without cybernetic augmentation. Augmented Kakerlake have a photographic memory. BOOMTOWN contains a sparse ecosystem, all descended from pests aboard the original generation ship. Most notable species include plants that use ionizing radiation for "photosynthesis" and a type of bee-like insect that eats metal. About the size of bumblebees, these insects build hexagonal hives similar to those of paper wasps, but out of metal. They are able to consume and regurgitate most materials. Bee hives are watched over and directed by Beekeepers--Kakerlakes with bee nests embedded in their backs. Note on technology: The Kakerlakes currently possess no fictional science (aside from possibly the cybernetic brain augmentation the Patriarchs use). Of course, fictional engineering isn't off limits. -Hull Size (In metres): 704m sides, 512m long, 576m apothem; Volume 34,600,000 m^3; Mass 18,700,000 tons. 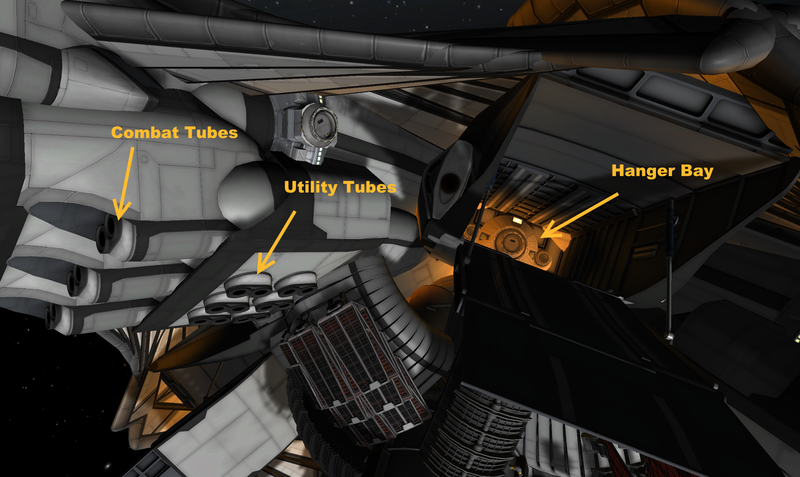 A total of 54 missile/strikecraft tubes (although only 18 of them can launch while radiators are deployed). BOOMTOWN has many names. They change on a regular basis, as altering the ship's registry is a convenient way to remind the crew what quest they're currently on. BOOMTOWN has no dedicated weapon systems. Therefore you should assume it's unarmed. No Kzinti lesson to be learned here. Move along. Orion Engines: Three Orion nuke-pulse engines (Exhaust velocity 480,000 m/s). Each Orion is aligned with BOOMTOWN's center of mass, and can independently provide a maximum acceleration* of up to 12 gravities (All three sum to 24 gravities). The Orion drives are by far the most durable part of the ship. Medusa (Exhaust velocity 900,000 m/s) is used for interstellar voyages, and only provides a maximum acceleration* of about half a gravity. *Acceleration figures assume BOOMTOWN's reaction mass is at ~75% of maximum (which is standard; Cockroaches need somewhere to live, after all). Atmospheric Capability: Yes, but not advisable. BOOMTOWN's heavy armor acts as excellent heat shielding, and it can survive aerobraking at any non-relativistic velocity. The planet, however, might not. RCS: Six nuclear thermal RCS nozzles provide decent maneuverability in situations when the Orion drives are unsuitable. FTL: None currently. I hope to get an FTL system from first contact. Armored Bulkheads: Sixty-four meter thick multilayer refractory tungsten and carbon ceramics form a tremendously durable--abet incredibly heavy--heatshield. It's not just a solid slab of metal--these are layers of ablative and conductive armoring, honeycombed with both water and liquid sodium coolant pipes. Large portions of the armor aren't even solid--much of the tungsten powder that serves as BOOMTOWN's reaction mass is stored in these bulkheads. Before suffering damage, BOOMTOWN will attempt to dump heat by venting coolant (first water, then sodium) out of the six "Thermal Control Nozzles" (located at either side of the Orions). 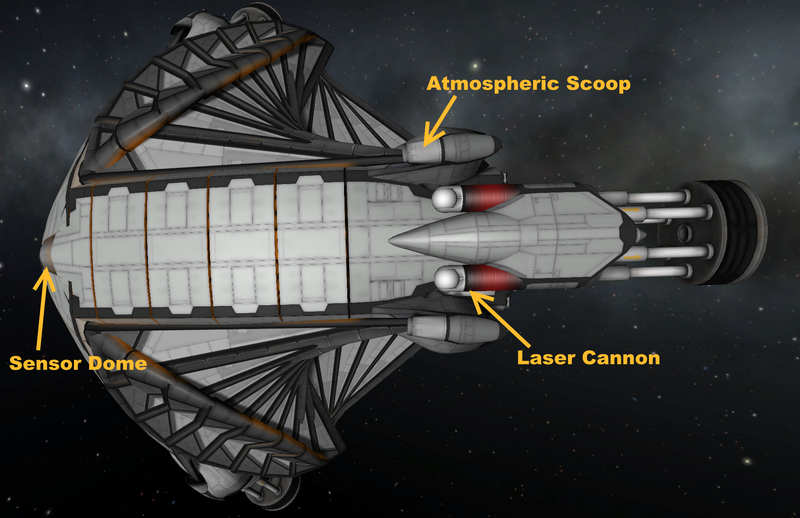 These double as additional maneuvering thrusters. 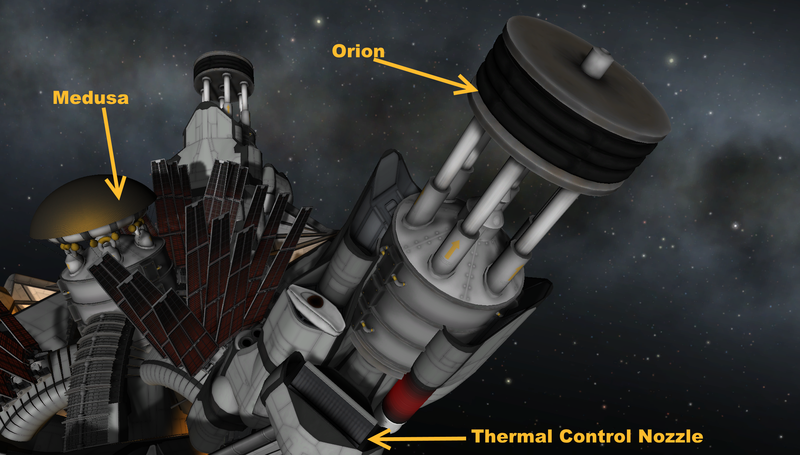 After suffering substantial thermal damage, the heatshield will melt in a controlled fashion, retaining structural integrity as the tungsten reaction mass within becomes additional armor. Carapace Plate: Solid refractory tungsten-carbide. Between 34 and 22 meters thick, and very well angled. 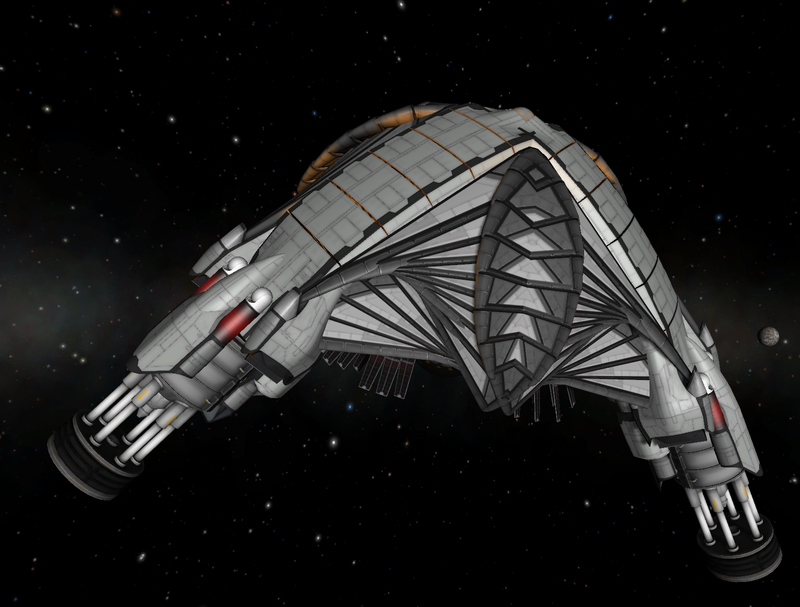 Additional Defenses: A highly efficient radiator array which is conveniently hidden behind the frontal armor. Laser turrets can act as point defense. Also, three Orion engines tend to disrupt or radiation-kill ordinance that would otherwise be very threatening. Through a combination of Kakerlake ingenuity and bees, BOOMTOWN has exceptional self-repair capabilities. Just looking at an atomic blast blinds most eyes and sensor systems. BOOMTOWN spits out as many as three bombs every second. Being anywhere remotely near the ship while it's accelerating causes major radiation and optical damage. Oh, and it's got some weak lasers that might be able to blind a camera or two. But compared to the engines, those are insignificant. 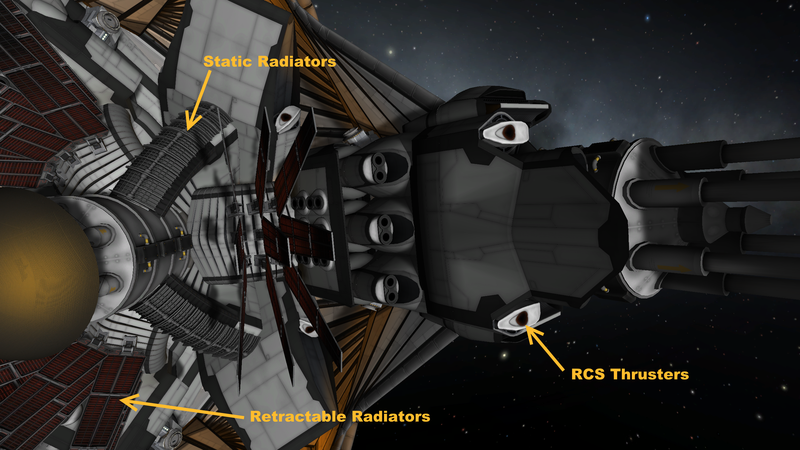 Six main fission powerplants--whose primary function is to power the RCS thrusters. Secondary uses include running the laser batteries and providing the ionizing radiation that various plants and algae need to "photosynthesize". Computers in BOOMTOWN are operated by taped recordings of dead cockroaches. Because of their primitive design, they are immune to EMP or radiation damage. Three hanger bays, 7680m^3 volume each; capable of production and rapid prototyping similar to that of a Homeworld Carrier. BOOMTOWN hosts three frigate-sized mining craft and around sixty strikecraft sized ships of various types (some in launch tubes, some in hangers, some in storage). Support craft will be designed and posted as needed. -Sensor Type: Optical, spectroscopic, radar, etc. Anything on Atomic Rockets that isn't space magic. Welcome to the GC Shoutbox!